I adore all of these ingredients by themselves, so I had little doubt I would love the combination. Turns out, it’s just as fantastic as I imagined! 1. Add more filler. I think I may add more finely shredded cheese next time. 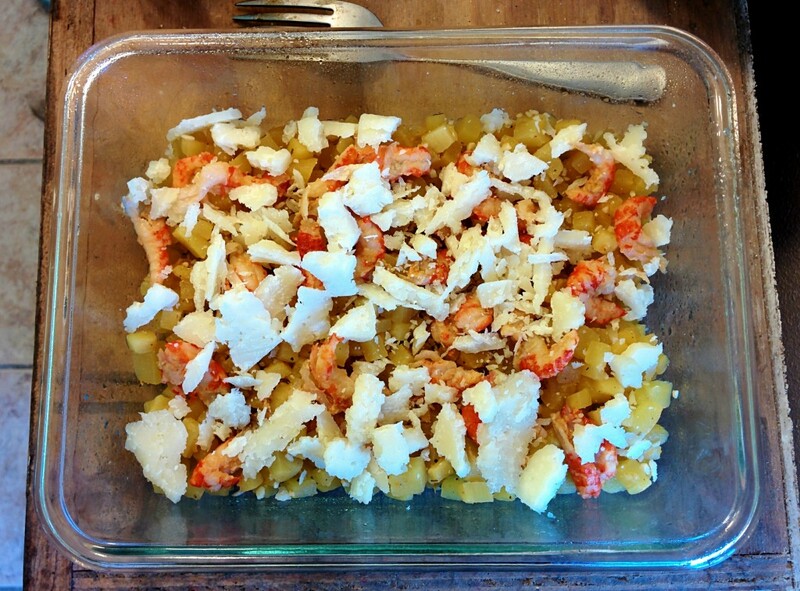 I couldn’t bear to part with ANY amount of my manchego cheese, so I crumbled it by hand. I refused to allow a grater to hang on to a single morsel. Since I will always suffer from such a problem, I would add a cheaper filler cheese. Maybe some 75% reduced-fat Cabot cheddar. I mean no offence, Cabot. This cheese is wonderful and serves its purpose, but very few cheeses manage to hold on to their flavor when reduced to such a low fat content. 2. Add more crawfish! I was being stingy with the crawfish. I wanted to save some of the tail meat for another recipe. Next time, an entire package could go into the recipe. There is no such thing as too much crawfish. It can be a little pricey though. 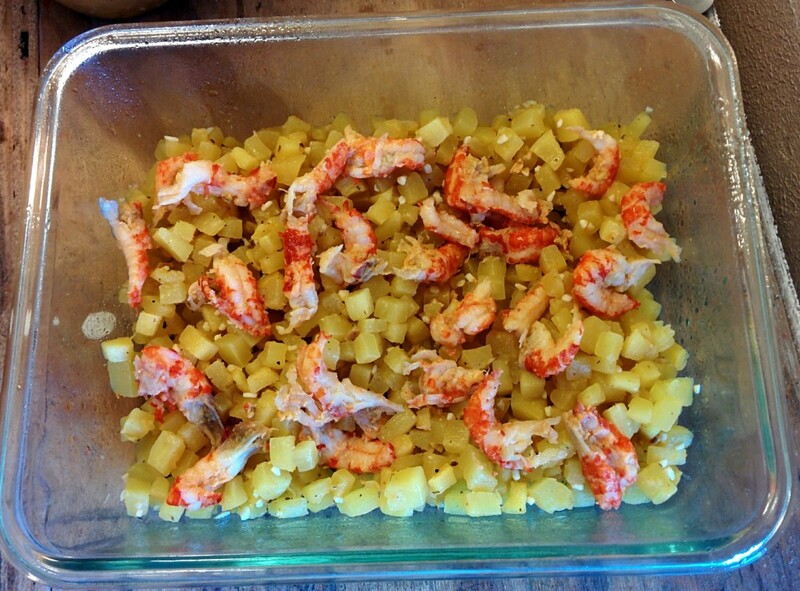 So 3 oz was enough to give the casserole flavor, but if there is more available… more is better! 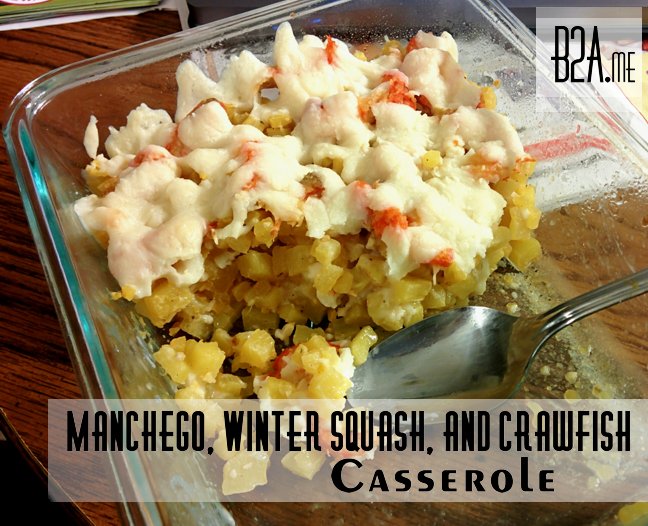 A delicious blend of cheese, crawfish, and winter squash. 1. Roast winter squash with butter, garlic, and sage- until tender. 2. Grease or spray casserole dish. 3. 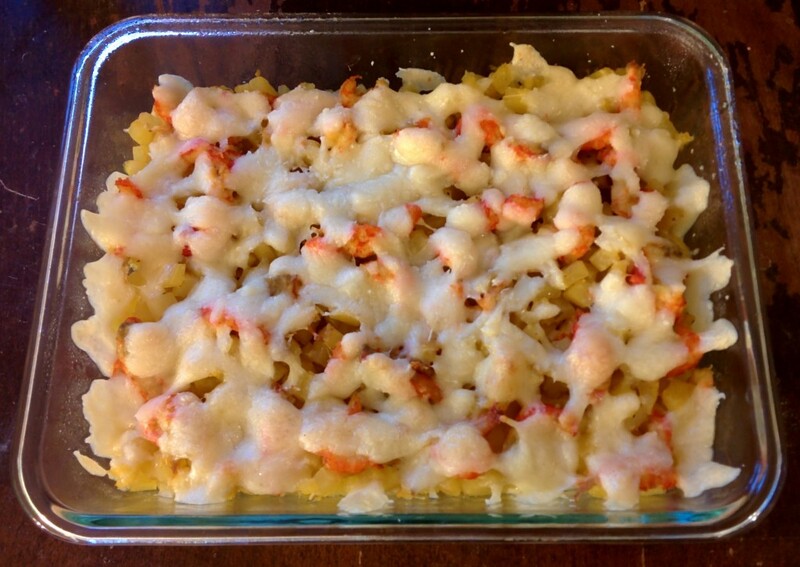 Layer roasted winter squash, crawfish, and shredded cheese. Repeat until casserole dish is full. 4. Bake at 350°F for 25-30 minutes. Roast the winter squash the day before. Then the casserole can be prepared very quickly; just some layering and you're good to go! Picture of the process! I just got myself a niffty new phone with a niffty new camera. I couldn’t resist the urge to photograph everything. Step One: Layer in some winter squash and crawfish. I HIGHLY recommend manchego cheese. The cheese connoisseurs over at Whole Foods pressured me into trying a sample once day. I fell head over heels in love. The love affair was initially fraught with difficulty, due to prices and location of Whole Foods. I struggled to justify the expense and time required to meet my lover. However, not but a month after the love affair began, I discovered manchego cheese at the local grocery store!